Mike was born as the youngest of five children on Earth in late 2354. His father was a shipbuilder, and his mother was a stay-at-home mother in an effort to raise their children. As soon as he was old enough, Mike went to work with his father building Starships, but his heart was further out in the stars. This lead him to be the first of his family to leave for Starfleet, albeit later in life, and he decided to use his skills to help ships that needed him in exploration. He chose to go Engineering, where he excelled. He had several rather uneventful years at PFY doing the same thing he did at home: building ships. 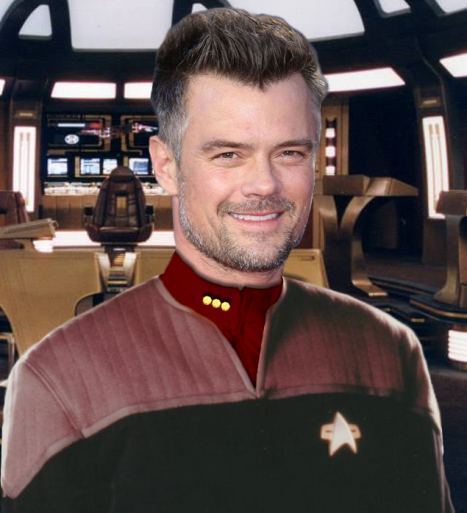 This wasn’t exactly what he imagined doing when he joined Starfleet, and took every opportunity possible to make that known. Several requests for transfer and 3 years later, he was finally transferred into the fleet as a shipside Engineering Officer, with a promotion to LtJg. It was here he would prove himself, a dedicated Warp Engineer, and his knowledge of the inner workings of a starship, proved his worth to the fleet. Originally he wasn’t going to remain on the ship, however a promotion to the position of Assistant Chief Engineer kept him there, and within the year he had taken over for the chief, who retired. After several years, he was transferred to PFY again, this time as the assistant to the N9 director. This was an interesting change of pace for him, as he had not previously stated a desire for administrative work. He later found out that part of the reason for the transfer was the injury he received on the ship, which ended up in the replacement of one leg with a cybernetic replacement biosynthetic limb. The transfer also included a promotion to LtCmdr, which was followed up 4 years later with a promotion to Cmdr following his appointment as N9 Director (Director of Civil and Military Affairs).